For an onion to be called a “Vidalia” it must be grown in a very specific part of Georgia which includes all or portions of twenty counties. This is mandated by Georgia state law and the USDA. Vidalia onions are now in season and it’s good to stock them when they are available. They are a sweet onion and adapt themselves to a number of uses and recipes. In the early ‘90s, when I was the resident director at a Birmingham theatre, I worked with an Ole Miss graduate named Catherine. During that time, I often had people up to my apartment on Red Mountain to watch football or play cards and Catherine proved to be a good source of festive party food recipes. By far the easiest and most popular of my recipes from Catherine is one for a Vidalia Onion Dip. I only make it when Vidalias are available because no other sweet onion seems to work with this recipe. When Catherine wrote out this recipe, she was very specific that I had to use exactly what she listed – no substitutions. I tend to tinker with recipes so even though Catherine had laid down the law, I tried the recipe with variations a couple of times. I can tell you from experience that you must stick to this recipe. Mix ingredients and bake at 350 degrees for 45 minutes to 1 hour (until bubbly). Let it cool to room temperature and stir before serving. One time, when Vidalias were not in season, I made the dip with another sweet onion and it was awful. Another time, I substituted another brand of mayonnaise for Hellmann’s and it didn’t work. So this is one of those recipes that you should just follow and never question. Catherine liked to serve the dip with melba rounds but I find that any sturdy, non-assertive bread or cracker works fine and I think it’s very tasty with Triscuits and with toasted French bread. It is also a fine dressing for a sandwich. I spread it on bread for a tomato sandwich recently. Since I mentioned Ole Miss, I will share Catherine’s version of “Ole Miss Dip.” Ole Miss Dip is ubiquitous and I suspect there are as many variations as there are Ole Miss sorority girls so I will say that this is one version of Ole Miss Dip but it is by no means the definitive version. And it’s easy too. Brown and drain the sausage. Add Ro-tel and cream cheese. Serve with tortilla chips. 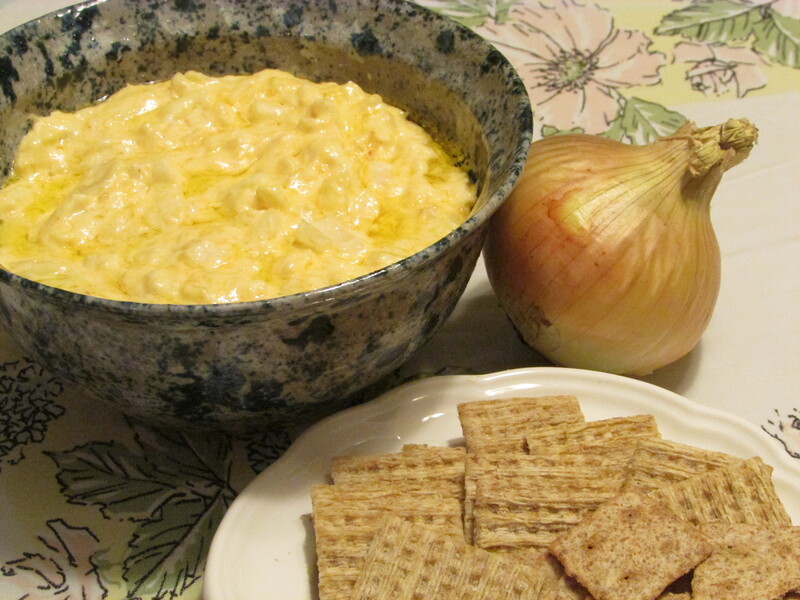 This entry was posted in dip recipes, Vidalia inions, Vidalia onion dip and tagged Conecuh sausage, Georgia, Hellmann's mayonnaise, Ole Miss dip, Ro-tel recipe, tailgating recipes, University of Mississippi, Vidalia onion recipe on May 29, 2015 by gedwardjourney.